is the ultimate styling tool for creating spectacular Internet, print, and video graphics. It is a powerhouse of sensational special effects, yet retains the friendly ease of use that made the original TypeStyler so popular. 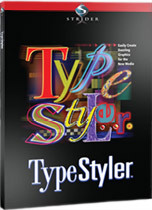 A complete stand-alone design, layout, and typographic effects program, TypeStyler also works seamlessly with Photoshop®, Illustrator®, InDesign®, XPress®, Keynote®, and many other popular applications. TypeStyler is an extremely sophisticated yet simple and intuitive page layout, graphic design and rapid packaging mock-up application that allows users to create spectacular graphic designs by applying special effects and distortion to type and graphic images. Using TypeStyler, users can bend, twist and shape text using all fonts made available to your Mac System. TypeStyler can easily create millions of different style variations by combining glows, embossing, transparency, fades, starbursts, shadows, patterns and more. TypeStyler is a complete desktop publishing tool, providing the full range of features needed to quickly design, layout and print headline text and logos, as well as complete ads, signage, and packaging graphics and package mock-ups. With TypeStyler's easy layout capabilities and new 3D Visualizer, professional, high impact graphics can be created in a flash. TypeStyler is widely used in educational settings as a powerful yet easy introduction to desktop publishing. Specifically designed for desktop publishers, multimedia designers, package designers and screen printers, TypeStyler can be used by professional graphic artists as well as the general Macintosh user. Glows, chisel and bevels, embossing, metal, gloss and neon, bump maps, textures, transparency and opacity, soft and cast shadows and blurs can easily be applied to any TypeStyler objects. Characters can be with filled pictures, color, patterns, gradient and radial fills and more. Create custom gradient and radial fills. Soft, cast, 3D and zoom shadows with the ability to select light source, color, pattern, inline & outline as well as fade in or fade out. TypeStyler's Path Magic tools can produce amazing custom path designs in seconds - attach swashes and flourishes to text instantly, punch text-shaped holes in other objects, knock out overlapping objects and more. Special functions allow the user to create symmetrical objects easily and quickly. User can create and modify perfectly circular text to any diameter, arc, or height. Control inlines and outlines of characters from one to forty points. User can set line screen, screen angle, dot size and dot type. Manual kerning and letter, word and line spacing. Overlapping text, from left to right or right to left. Text can be aligned left, right, or center. Text and graphics can be freely rotated with rotation tool. Ability to specify point size or automatically size to shape. TypeStyler 11 (v11.6) requires Mac OS 10.6.8 through Mac OS 10.14.x (Mojave). TypeStyler 10 (v10.6.75) is compatible with Intel Macs running Mac OS 10.5.8 through Mac OS 10.7 (Lion) and PowerPC Macs running Mac 10.4.11 through Mac OS 10.5.8. Grunge Effects - TypeStyler has always made stunning, gorgeous text. Now with the new Grunge Effects you can easily make aged, distressed, weathered and downright filthy-looking vintage graphics. You can choose styles with scratches, holes and beat up, worn out, weathered effects -- right from the Style Library! You can also modify, create and save your own Grunge Styles. Social Media Export - Now you can share TypeStyler graphics by posting directly to Facebook and Flickr. You can also quickly attach them to e-mail or add them to your iPhoto library. Cropping & Positioning Images within Objects - This new version lets you adjust the position of pictures within both Text and Graphic Shapes. This is profoundly more useful and just plain fun, too. TypeStyler provides complete typographical control. Text can be manipulated by Bezier curves into almost any shape or size. TypeStyler text objects are always editable, allowing you to design once yet modify your work at any time for reuse. TypeStyler imports photos and almost any graphic, allowing users to precisely combine illustrations and text. Visual interface makes TypeStyler remarkably fast to learn and use. On-screen WYSIWYG display of distorted objects and text. Unlimited possibilities for creating different styles that can be stored in your own library and applied to any object. Includes ready-to-use templates. Use these as jumping off points for your own designs. Built-in drawing tools let you easily create and edit custom artwork within TypeStyler. TypeStyler's intuitive interface lets you get stunning results without a steep learning curve. The 3D Visualizer lets you see your designs in 3D, wrapped on geometric models such as spheres, cones, disks, planes and cylinders. Bottle, bag, and can models enable you to quickly design commercial packaging mockups. Animation features make creating spinning and orbiting logos a snap. Save animations as QuickTime movies for easy integration into video editors such as Final Cut or to include in web designs. TypeStyler's built-in PosterMaker prints your designs scaled to any size you need, from postage stamp to billboard. Large printouts tile automatically, allowing you to print huge signs and posters from your desktop printer.